Colorful and heartwarming chapter book entertains and explains to children the vital role of a guide dog in the daily life of a blind person. "My name is Sammy and today my friend Cindy and I are going to the mall. I'm her guide dog and my job is very important. Cindy is legally blind and it's my job to keep her safe." The story will help children better understand the challenges Cindy faces and how her guide dog provides invaluable support. As Cindy Lou and Sammy travel through the shops, people stop to pet Sammy, but Cindy kindly asks them not to, explaining that he's working and needs to remain focused on his job. The book expertly explains why others should never disrupt a guide dog. Sammy also shares the rules he follows in his daily life, such as why he is only allowed to eat at certain times during the day, and what certain commands from Cindy mean to him. This will always be my favorite of Cheryl McNeil Fisher's books. She opened my students' eyes to the challenges she faces with humor and a highly engaging story. They wanted to read more of her work after listening to this story. 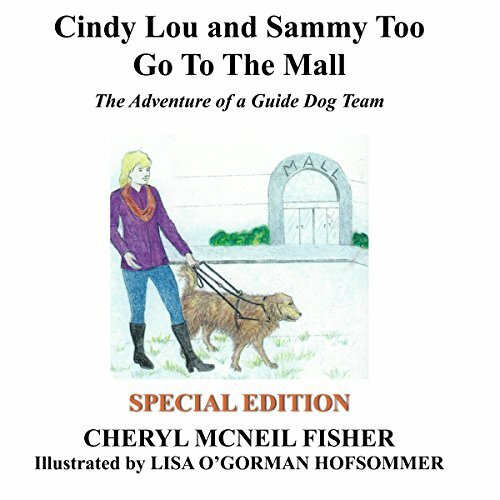 Would you consider the audio edition of Cindy Lou and Sammy Too Go to the Mall to be better than the print version? Both are very well done. What was one of the most memorable moments of Cindy Lou and Sammy Too Go to the Mall? When Sammy's tail knocked down the socks in the store. This is a very sweet and informative story that gives many fun and interesting details about the life of a guide dog team. It's written in a clever way that weaves lots of helpful information and instruction into a creative story that children can relate to.